[London, 3 October 2016] London Restaurant Festival in partnership with American Express® has teamed up with Ecoworld Ballymore to present London’s Longest Lunch on Saturday, October 1st at Wardian London and Embassy Gardens. The lunch kicks off a month of food and restaurant celebrations as part of the annual festival, involving the best restaurants and chefs the capital has to offer. The festival has two main elements, Restaurant Experiences and Festival Menus. London’s Longest Lunch features as the ultimate restaurant experience, offering a six course meal, a champagne river cruise and drinks receptions over the course of 105 minutes. The lunch will be split into two segments, with three courses at Ecoworld Ballymore’s Wardian London, adjacent to Canary Wharf, and three courses at the developers Embassy Gardens scheme in Nine Elms on the South Bank. Half the 124 guests will be at each location at a time. Once the first three courses are finished, guests will ride the Thames Clipper to the alternative location; whilst enjoying a Veuve Clicquot champagne reception and listening to an informal talk on the London restaurant scene. Following the 6 course meal, guests will journey to The Hari Hotel for an after-party of music and drinks. The dishes will be cooked by two of the capital’s leading chefs. Bentley’s Richard Corrigan, chef and owner of Corrigan’s Restaurants - having previously cooked twice for the Queen and earned two Michelin stars - will take up the helm at Embassy Gardens. 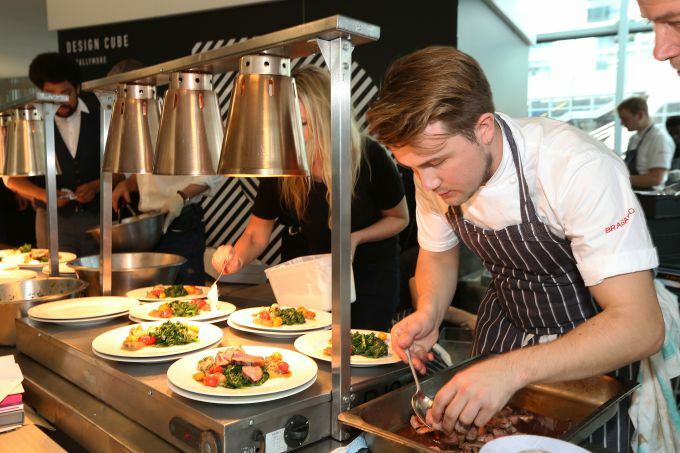 Cooking at Wardian London is up-and-coming Welsh chef, Tomos Parry, head chef at Kitty Fisher’s in Canary Wharf and known for his wood-fired cooking. Named Young British Foodie in 2014, Tomos was the winner of the Food and Travel award for Best Breakthrough Chef of 2015. The meal will be hosted in pop-up restaurants at two of London’s most prestigious new developments. Embassy Gardens lies adjacent to the new US and Dutch Embassy at the heart of Nine Elms, overlooking Chelsea and Pimlico. Once completed it will be a vibrant modern community, boasting stunning landscaped gardens, a riverfront walk threading between Embassy Gardens to Battersea Park and vibrant new bars and restaurants. It has exceptional architecture and design, with New York inspired red brick exteriors, and art-deco styled high quality interiors featuring light-coloured oak, marble and black granite. Wardian London is a new riverside development overlooking South Dock, with stunning views of Canary Wharf and the City. The botanically-inspired scheme will include extensive private ‘sky gardens’ in every apartment and a landscaped public plaza with more than 100 species of plants and flowers. Once completed, it will also include a vibrant rooftop observatory bar, two restaurants and a 25 metre open air swimming pool set within a flourishing tropical environment. Ballymore’s current development portfolio includes London City Island, Royal Wharf, Embassy Gardens, Wardian London, Dublin Landings, West Hampstead, Providence Wharf and more. EcoWorld is led by some of the most well-known and respected industry players, who between them have transformed the Malaysian property landscape through ground-breaking, standard setting and multiple award-winning developments. Chairman, Tan Sri Liew Kee Sin is well known for spearheading the regeneration of Battersea Power Station and other international projects in Melbourne and Singapore. Committed to its vision of ‘Creating Tomorrow & Beyond’, EcoWorld is inspired to focus on building distinctive and uniquely identifiable products which offer living environments that not only stand the test of time, but provide enduring value for generations to come.